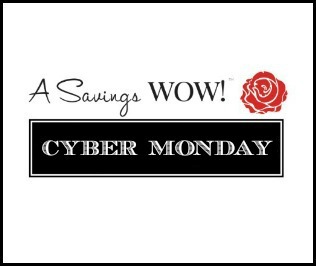 2014 Cyber Monday Deals | A Savings WOW! Thanks to Utah Sweet Savings for compiling most of this list! We will continue to add to the list as deals become available. – Ace Hardware: 15% off entire order. Free pickup at local store. Valid 12/1 only. – Amazon: Deals all week long. Lightning Deals on toys, games, music. Gold Box Deals of the Day. $1 credit for ebooks, music and video downloads for no-rush shipping for Prime members. Free shipping on orders of $35 or more for everyone. – American Girl: Up to 50% off accessories, clothes and more. – BabyLegs: Clearance leg warmers and socks for $3. 3 pairs of leg warmers for $12, 5 for $20, 10 for $35. Free shipping through 12/2. – BestBuy: FREE shipping on orders of $35 and up, or free in-store pickup. – Birthday Express: 60% off Cyber Monday Holiday Deals with code HOLIDAY60. Valid 12/1 only. – Bon-Ton: Take up to an Extra 30% Off Regular or Sale Price Merchandise Using Code CYBERSALE30 through 12/1. Get FREE Standard Shipping on any Online Order Using Code FREESHIP through 12/3. – Cents of Style: T-shirts 60^ off and free shipping w/ code CYBER. Free bracelet. – Choies: Up to 90% off now. Free shipping worldwide now through 12/8. Free Christmas gift on orders of $89 12/1-12/8. – Claire’s: Entire site $3, $5, or $10. Free Hello Kitty Backpack Clip with a purchase of $20 or more on 12/1. – Crazy 8: Buy one, get one $0.88 including markdowns, plus free shipping on 12/1. – Cricut: $5 Off Orders $50+ with code: CRICUTBF5 through 12/1. Cricut Explore just $229 & $20 off all Explore Bundles 12/1 only. – dELiA’s: 50% Off everything. FREE Shipping no minimum. Use code CYBER50. – Dell: 3 rounds of limited quantity doorbusters. Save up to 46% off popular PCs, tablets, and electronics. Free shipping! – DiscountMags: Pick 3 magazines for $12. Pick 5 magazines for $18. Pick 10 magazines for $30. – Disney Store: Use code CYBER. 25% off $100 order. 20% off $75 order. 15% off $50 order. FREE Shipping on $75+. – Dollar General: Free shipping on orders over $30. Toys B1G1 50% Off. – DownEast Basics: 30% off & free shipping with code THANKS30 (valid 12/1 only). Flash Sale with items $10 and under all week long. – Express: 50% off everything. Excludes gift cards. – Family Christian Stores: Exclusive online deals. $5 and 50% Off select DVDs through 12/7. Use code CYBER to get 25% off all week on regularly priced items. – Finish Line: 60% off Basketball Shoes. 50% off Running Shoes. 50% off Men’s tee’s and Shorts. 40% off Women’s Leggings. Free shipping on orders $30+. – GameStop: Big discounts on PlayStation 4 and Xbox One Consoles. Savings on many popular games. – Gap: 40% off with code CYBER. – GroopDealz: 15% off sitewide with code CYBERMONDAY15. – Groupon: Various Cyber Monday deals. – Gymboree: 50% off entire purchase. Free shipping. – Home Depot: Special deals on appliances, tools, holiday decor, and more. Free in-store pick up. – Janie and Jack: 25% off entire purchase. Free shipping. – JCPenney: Extra 20% off purchases up to $100 with any method of payment and 30% off purchases $100 or more with code CYBRMNDY. $2 shipping to home, free to stores over $25. – Joes New Balance Outlet: Extra 20% off. Free shipping on orders $50+. Sale ends 12/2. – Kmart: 1,000s of Deals Online Only. Shop Your Way Rewards Members Get 5% Back in Points. Free shipping on orders of $59+. Ends 12/6. – Kohl’s: Use code CYBER20 to save 20% sitewide. Automatic FREE shipping on ALL orders. Earn $15 Kohl’s Cash for every $50 spent. – LEGO Store: 20% off Select Sets- LEGO® Kingdoms: Kingdoms Joust, LEGO® DUPLO®: LEGO® DUPLO® Creative Building Cube, LEGO® Teenage Mutant Ninja Turtles: Stealth Shell in Pursuit, LEGO® CiTY: Cargo Train. Free Shipping (No minimum) Thru 12/1. FREE Limited Edition Holiday Set with purchase of $99 or more. Thru 12/1. – LivingSocial: 25% off. Use code CYBERSALE. Expires 12/1. – Lowe’s: Exclusive online deals. Free in-store pickup. – Mabel’s Labels: 30% off Skinny Minis and Tag Mates. 40% off Sticky Labels and Shoe Labels. 50% off Scan & Stores and Wash Aways. – Macys: Extra 15% off with code CYBER. Free shipping on orders of $50 or more. 1,000 new specials. – Old Navy: 40% off with code CYBER. – Office Depot/Office Max: Cyber Monday deals; online only; while supplies last. $40 off your qualifying purchase of $250 or more with code: 33345641. $20 off your qualifying purchase of $125 or more with code: 97212815. – Overstock: Hundreds of Doorbusters. New Deals added daily at 10 am MT. – Pfaltzgraff: Use code CYBER30 to save an extra 30% off your order – including clearance. Enjoy Doorbusters & free shipping over $49! (Exclusions Apply). – Puma: 20% off on orders of $75-$100. 30% off on orders $100-$150. 40% off on orders $150. Valid 12/1-12/3. – Rakuten.com (formerly Buy.com): Free shipping. – Robeez: 25% OFF with code Holiday14. Free shipping 12/1. – Sam’s Club: Free shipping on Cyber Week specials. – Sears: Free shipping on orders of $59+. Shop Your Way Rewards Members get back 10% in purchase. Valid through 12/6. – Shutterfly: New customers receive 50% off personalized ornaments with promo code ORNAMENTS through 12/4. ALL customers save an additional 25% on top of site wide savings with promo code CYBER25 through 12/1. – ShopKo: Over 500 deals. – Sports Authority: 25% off entire purchase. Free shipping on orders of $49 or more. – Staples: Save up to 85%. Free in-store pickup. Free shipping on orders of $50+ or free shipping for Staples Rewards members. – Stila: Up to 80% off beauty products through 12/8. – Target: Buy one, get one 60% off on Clothing, Shoes, Jewelry and Accessories for the entire family. Save an extra 10% with promo code: CYBER10 on fabulous Home items already on sale for up to 40% off. Save up to 50% on Our Generation Dolls & Accessories. Sign up for Target REDcard Debit to save an extra 5%. – The Body Shop: 50% off sitewide. Free shipping on orders of $50 or more. Through 12/3. – Tiny Prints: 30% off all gifts with code TPGIFTS30 through 12/2. 40$ off all cards with code CYBER40 through 12/4. Buy One Get One FREE Mobile Cases with code 1201DEAL on 12/1 only. Look for other 1-day deals all week. – TOMS: 25% off select styles with code CHEER. Free shipping on orders of $25 and up. Free shipping when you check out with Paypal. – Tommy Hilfiger: 5% off everything with code CM5. – Signing Time (Also known as Two Little Hands): 25% off + FREE SHIPPING on orders of $25 or more with code cyber25. – UGG: Special prices through Monday. Free gift wrap and free 2-day shipping on orders of $150 or more with code UGGCM2DAY. – Walgreens: 25% off regular priced items with code GIFT25. 25% off everything photo with code DEAL25. 40% off calendars with code CALSFORTY. 40% off photo books with code BKFORTY. 50% off Photo Cards on Sets of 3+ with code 3CARDCHEER. – Walmart: Free shipping on orders of $50 or more. Up to 50% off electronics, toys and video games, home and appliances, and much more. – Zazzle: Up to 65% off with code ZAZCYBER2014 valid 12/1 only. FREE Shipping with code zBlack.